Robert Lorenzo Brazile, Jr. (born February 7, 1953) is a former professional American football linebacker in the National Football League (NFL). Nicknamed "Dr. Doom", Brazile played from 1975 to 1984 for the Houston Oilers. Brazile was taken with the sixth pick of the first round of the 1975 NFL Draft. It was part of the bounty Sid Gillman acquired along with Curley Culp when he traded John Matuszak to the Kansas City Chiefs. However, it would be new head coach/general manager Bum Phillips who made the selection. Phillips' arrival in Houston also brought a change in the base defense the Oilers ran, switching from a 4-3 to a 3-4. The 3-4 would prove to be a perfect fit for Brazile's combination of size (6'4", 230 lbs) and great speed. While most cite Lawrence Taylor as the prototype of the pass-rushing outside linebacker in the NFL, there are some, including Phillips, who say Brazile was the one who first made the 3-4 popular for sending an outside linebacker to rush the quarterback. Brazile also performed well in pass coverage and against the run, consistently ranking at or near the top for the team lead in tackles even though opponents often avoided his side of the field. Brazile found immediate success with the Oilers, winning the NFL's Defensive Rookie of the Year award for the 1975 season. He was named to the Pro Bowl seven straight seasons, was All-Pro five straight seasons (1976–80), and was selected to the NFL's All-Decade Team for the 1970s. He is the only linebacker from the 1970s All-Decade Team not in the Pro Football Hall of Fame. In 1978 and 1979, Brazile was a key member of Oilers teams that went to back-to-back AFC Championship games. After a third straight postseason loss in 1980, Phillips was fired by Oilers owner Bud Adams and the team entered a period of steep decline. The constant losing wore on Brazile and caused him to contemplate retiring. However, he has said it was the death of his first wife, Cookie, in a car wreck in Houston in 1984, that made the decision for him. Officially, Brazile finished his career with 11 quarterback sacks. Unofficially, his career sack total is 48 (sacks did not become an official NFL statistic until 1982). He is also credited with 1,281 tackles, the second highest total in Houston Oilers / Tennessee Titans history. After retiring from the NFL, Brazile, along with ex-Oiler teammate Ken Burrough, coached for a minor league pro team in Mobile, Alabama. After needing quadruple bypass heart surgery in 2004, Brazile gave up coaching and became a middle-school teacher for children with special needs in Mobile. He has also become an avid tennis player. When asked if his old "Dr. Doom" persona ever comes out on the tennis court, he's quoted as saying laughingly, "No more Dr. Doom," "Just Robert Brazile." In 2007, Brazile was inducted into the Bancorp Mississippi Sports Hall of Fame. ↑ Litsky, Frank (1989-11-30). "Taylor is Sidelined for the Eagles Game". The New York Times. Retrieved 2008-03-06. ↑ "Remembering the Luv Ya Blue Oilers". Chron.com - Houston Chronicle. Retrieved 2008-03-06. ↑ "Big Time Brazile". Caller.com - Corpus-Christi Caller-Times. Retrieved 2010-08-16. ↑ "Oilers were toast of Houston and nearly NFL, too". Chron.com - Houston Chronicle. Retrieved 2008-03-06. ↑ "Catching up with the Luv Ya Blue crew". Chron.com - Houston Chronicle. Retrieved 2008-03-06. 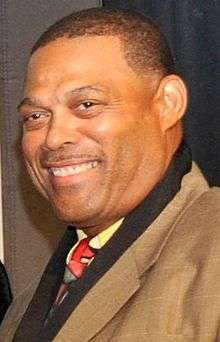 ↑ "Former JSU great and Houston Oiler inducted into Mississippi Sports HOF". jsutigers.com - Jackson State - Athletics. Retrieved 2008-03-06.